​My reasons, of course, run deeper. My choice to make aliyah last year, at the age of 24, came from a strong sense of responsibility for the Jewish people, a pull to keep on writing the Jewish story toward justice. ​As a child growing up in Philadelphia, I developed a great love for being Jewish, gathered in pieces I absorbed in different settings: from my family, appreciation for ritual and song; from Jewish day school, a taste for Hebrew; from my Reconstructionist synagogue, love of Torah and Jewish learning; and from my Zionist youth movement, connection to Israel and leadership as a youth educator. I tried, as teenagers do, to reconcile this relationship to tradition with my desire to rebel. ​During my summers at Habonim Dror Camp Galil, the Ottsville, Pa., branch of the progressive Labor Zionist youth movement, campers learned to be activists within the Jewish people. Our counselors taught us to be critical of the society around us, analyzing sexism in advertisements, racism in our cities and worker exploitation all over the world. We studied the chalutzim (pioneers) who built a new society in Israel and emulated them by doing physical labor to maintain the campgrounds, creating a youthful Jewish culture and grappling with the ideals and the reality of Zionism. 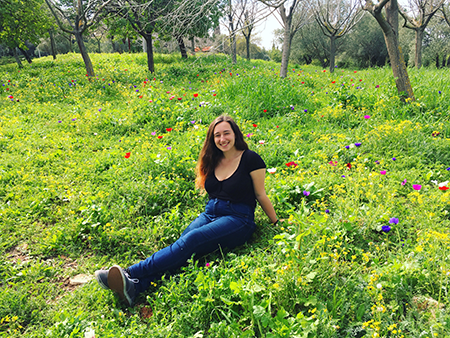 Through trips, seminars and Habonim Dror’s Workshop gap-year program in Israel, I developed a complex set of feelings toward the country. On the one hand, I loved Israel—its physical beauty, its vibrant mix of Jewish cultures and, most of all, the potential it contains. Theodor Herzl dreamed of an old-new land that adapts and recreates Jewish traditions; I, too, saw in Israel what Herzl termed the “infinite ideal” of a just Jewish society that would follow the founding of the state. Anya Friedman-Hutter (second row, right) with other ‘olim’ from Habonim Dror North America and Australia. ​But I also saw a society deeply riddled with inequality. 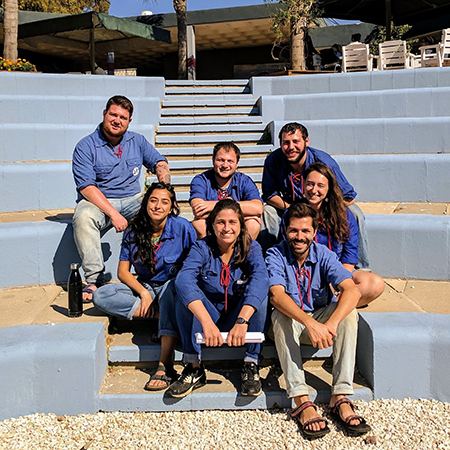 My Habonim partners and I could not look away from the country’s wide socioeconomic gaps, racism, exploitation of workers and persistent violence and occupation. ​I did not know what to do with my love for and anger at Israel. I felt distant and powerless, a spectator to the great drama of my people’s story unfolding. From my first years at Camp Galil, I learned about hagshamah, that if I cared about something I had to turn my feelings and dreams into actions. After years of leadership positions at the camp and working for the movement, I decided to form a garin (aliyah-bound collective) with my age cohort. For some, that meant staying in the United States for two more years to lead the movement on a national level; for the rest of us, it meant making aliyah. ​The Israeli high schooler who could not believe I would choose to make aliyah is one of the youths I lead in Karmiel, where my messima, or educational mission, is to work in the local branch of the youth organization HaNoar HaOved VeHaLomed. The group brings educational and cultural activities primarily to adolescents who have part-time jobs and helps them fight for their employment rights. ​In Karmiel, a small northern Israeli city populated mostly by immigrants from the former Soviet Union, I live communally with my garin and other members of Dror Israel, the movement of educators who reside in urban kibbutzim. ​The first chalutzim wrote that they had come to Eretz Yisrael “to build and to be built.” Over 100 years later, my garin holds the demanding mission of both joining and changing Israeli society. Beyond the daily challenges of adapting to a new language and culture (my polite American self struggles to bargain at the market), I face dilemmas about what life as an olah holds for me. How much can I actualize my dreams for Israel? How will I be changed by living and leading here? I find myself feeling both welcomed and feeling like an outsider. ​What keeps me going is my pride in being a member of the Jewish people. In the choice to leave a comfortable home in the United States to take part in the Zionist experiment, I am tying my life to the lives of the people who live here, and I’m investing in our collective story. It is our struggle to move Israel toward the ideal Jewish society it deserves to be. Anya Friedman-Hutter grew up in Philadelphia and graduated from the University of Pennsylvania before making aliyah in September 2017. Wonderful article Anya. Thank you for inspiring us towards an ideal. It is very nice and admirable that you moved to Israel and have a good feeling about Judaism. Given that Habonim has changed so dramatically from the old days (sixties), it is amazing that anyone moves to Israel from the Habonim group. It seems to be very similar to J Street, which hates Israel, and many of the “leaders” of the new reformed Habonim are members of J Street, which supports BDS. They should call Habonim something else, as it has very little resemblance to what it stood for. They still have the blue shirts — it is a distortion. Inspiring, and takes me back to many of the experiences, and organizations, of my own youth — a while ago. How much I admire your committment and compassionate vision, Dear Anya. process of your journey and the insights that have shaped your goals. Yasher Koach and Big Hugs ! Who decides what is “the ideal Jewish society it deserves to be”? Do we truly live your own dreams, or the dreams of our ancestry & /or educators that brainwashed us? Such heartfelt article. You are an inspiration to your generation and a role model to all. Israel is lucky to have you and we are lucky to have you in Israel. frankly, you should have stayed home. I don’t think Israelis need another brainwashed Jew to come and tell them about “proportionality” or “occupation” or “racism” or any other unthinking and unintelligent perspectives on “justice”. Maybe you will open your eyes while in Israel. Maybe the ham is too thick. Hi Anya. While I was part of the Washington ken in the 1968s (and belonged to the 13th workshop 1963-4) went to Temple and still have a warm spot for Philly and some of the people from Philly Habonim. I made aliyah in 1968 at age 22 and will celebrate 50 years in Israel (my second ‘rebirth’) next week along with my 73rd birthday with my kid and grandkids (Who live in the Big Orange ) and husband here in Kfar Warburg (a moshav south of Rechovot and east of Ashdod). Making aliyah was the best decision in my life. Usually after 50 years there are regrets, but you still have a good outlook. Yasher Koach to you! Anya, you make me proud. I was on Habonim’s Ninth Workshop, in 1959, the first at Gesher HaZiv. Almost 60 years later, we still keep in touch and some of us have remained devoted friends since adolescence. Some made aliyah; some stayed and some left. Among the many (high-level!) discussions we used to have is: If Israel is the Jewish Homeland, should all Jews settle there? Now, from were I live in the US, I think not. While we remain devoted to Israel, we are also vital to the cause of Hasbarah: explaining and interpreting Israel to the Nations of the World. Why? Because antisemitism is not only the longest hatred, it apparently is the strongest. And Israel doesn’t do the best job of countering some of the virulent bias against it with equally forceful facts. The latest Gaza confrontation is a perfect example. Thrive in Israel, Anya. You are the perfect age for an Olah. May you, indeed, be part of “Livnot u’Lhibanot” (to build and be built). The idea here, is to love Israel from wherever, and assure her survival and strength – despite warts. And keep writing about your experiences!